More than half of hospital staff in England wouldn’t eat food served to patients because it’s unhealthy and of poor quality, according to a survey by UNISON published today (Wednesday). Many NHS employees and those working for private firms, including nurses, porters and those in administrative roles, also reveal nutritious meals aren’t available to buy at work, especially when on night shifts. No free drinking water, poor food-preparation facilities or meals unsuitable for their dietary or religious needs were among other top complaints from more than 300 staff across England. The findings highlight the failure of the NHS to ensure hospital vending machines, restaurants and shops provide decent quality, nutritious meals. Staff also complain they are unable to heat up and prepare food on site, according to UNISON. The issue of food in hospitals and meal options for staff is being discussed at UNISON’s annual health conference in Bournemouth this week. Half of respondents (50%) thought meals were neither nutritious nor good quality, while slightly more (53%) said they wouldn’t eat food prepared for patients. Another major concern was the lack of healthy, inexpensive food and drink options for employees. Nearly a third (32%) said on-site vending machines sold no nutritious snacks. Similar complaints were made of restaurants (16%) and shops (16%). More than one in ten (12%) said they had no access to free drinking water and more than a quarter (28%) that they could not buy food suitable for their diet or religion, such as vegetarian or halal options. Staff said that healthier foods, such as fruit, vegetables and low-fat, low-sugar choices, were hard to find at night despite almost a third (32%) of staff working shifts. Those who brought food from home (71%) to eat at work often found preparation facilities, such as microwaves and kitchens, fell short of expectations. Two in five (40%) rated these as “bad” and just over a quarter (26%) said they had no dedicated area to eat. The high cost of nutritious food at work was cited as the biggest barrier to eating healthily (61%). UNISON head of health Sara Gorton said: “Everyone in hospitals including staff, patients and visitors deserves healthy food that’s reasonably priced. “Patients who are ill need nutritious and appealing meals to help them recover. Busy staff also need nourishing choices and proper breaks so they can re-charge on hectic shifts. -The survey was carried out in December 2018 with 353 responses from employees. The vast majority (99%) were NHS and the rest worked in the private sector. They included those in nursing and midwifery (32%), administrative and clerical (23%), clinical support (29%), facilities and estates (13%), therapies (5%) and other roles (9%). 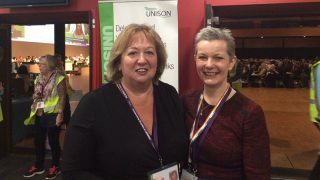 -Hospital food and meals for staff featured in motions 31, 32 and 33 at UNISON’s annual health conference in Bournemouth. Click here for full details of the motions.